Dash Design and Disc is a short-run CD/DVD duplication and graphic design firm based in West Seattle, geared to performing musicians, independent video artists, small businesses and others who desire industrial-strength delivery on a copy shop budget. Our goal is to provide useful, practical products and services that compare favorably with high-end equivalents in quantities more suited to the alternative market. We offer much of the flexibility and choices available from larger-scale sources, plus the convenience and affordability of local on-demand production. We’ve Done This Before. Dash Design represents over 25 years of practical graphics and duplication experience. We’ve developed designs and products for local, regional and national level clients, including hundreds of audio/video products and projects, print ads, web sites, press kits, PR photos, stationery and business cards, pamphlets — you get the picture. Price, Price, Price. Because we’re a home-based service, our prices are just about as low as you can get. We consistently beat the big-box stores’ short-run duplication prices, especially when you consider shipping charges. Fast, Fast, Fast. Our official disc duplication turnaround is a week. That’s from the final approval of the proof to delivery. Frequently we’re even faster. And for those in a truly scary hurry, we have three-day guaranteed rush service. What else do you need? We’re charming, intelligent, creative — cute, even. We take major credit/debit cards and checks. We’ll give you a 10% discount and free UPC with a 100 order*. We’ll let you drop by after hours and miss the traffic. 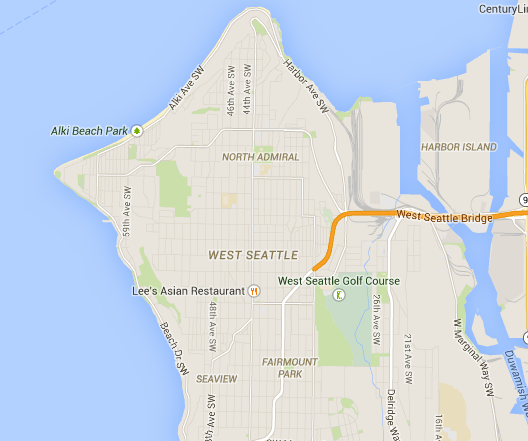 We’re a great excuse to visit scenic West Seattle. Mostly though, we’re just a swell little business you ought to check out for your design and duplication needs. Seriously! *See pricing page for details.